spicy onions in a mix of lemon juice, spice powders and salt. peel and rinse 1 medium sized onion. thinly slice them in to rounds or you can halve them and then slice. take them in a small mixing bowl. add all the spice powders, lemon juice, salt. mix well. lastly add 1 tsp each of chopped mint and coriander leaves. you can also just add either mint or coriander, if you do not have both. mix very well. check the seasonings and add more of the spices, lemon juice, salt if required. 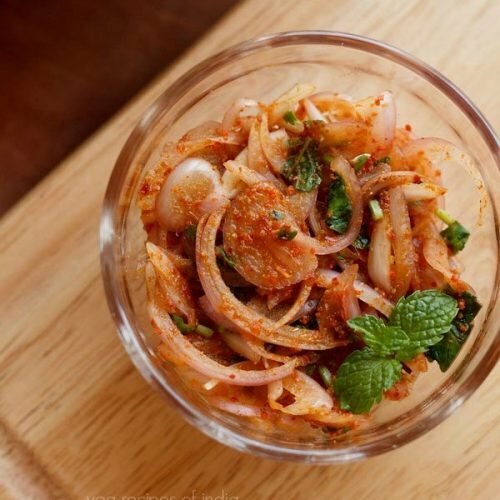 serve masala onion salad with your meals. - use onion which is not very pungent. - spices & lemon juice can be adjusted as per your taste.